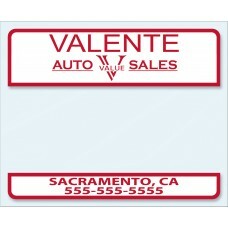 Report of Sale Stickers (ROS Stickers) are an adhesive backed vinyl decal that is printed with your dealership name and logo that is used on the back window of the vehicle to seal in the registration form until the permanent plates are issued. 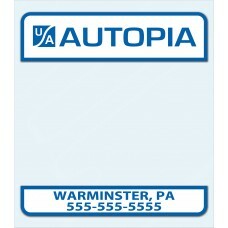 We offer two varieties which are sized appropriately to fit the Pennsylvania and California vehicle registrations. This product is constructed from 4 mil clear vinyl film and serves the purpose of advertising your dealership while also protecting important legal documents.